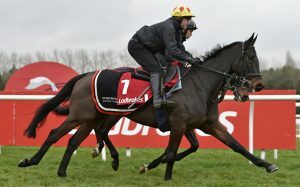 The second Ladbrokes Winter Carnival Gallops Morning took place today at Newbury in front of the media and around 200 Annual members. Trainers Paul Nicholls, Nicky Henderson, Anthony Honeyball, Tom Lacey and Richard Hobson worked and in two cases schooled horses this morning ahead of the Ladbrokes Winter Carnival on Friday and Saturday, November 30 and December 1. Each of the trainers is hoping to have a runner in the feature Ladbrokes Trophy, run over three and a quarter miles at 3.00pm on December 1 and worth £250,000, making the race Britain’s richest handicap chase outside of the Grand National. Nicholls schooled two horses, Topofthegame (Harry Cobden) and Chameron (Sam Twiston-Davies) over 10 fences in all, with the former due to run during the Ladbrokes Winter Carnival. 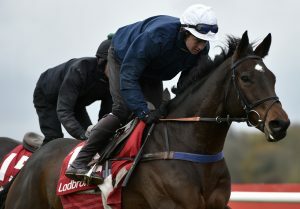 The Somerset-based trainer also had news of Black Corton (11st 4lb – 20/1 with Ladbrokes), his Ladbrokes Trophy contender who will be ridden as usual by Bryony Frost and won eight times last season. He revealed: “Black Corton definitely runs in the Ladbrokes Trophy and Topofthegame will be entered in a novices’ chase at the meeting. “Back Corton has come out his second in the Charlie Hall Chase very well – everything is right for him in the Ladbrokes Trophy. “He ran very well the other day in the Charlie Hall and was a bit unlucky with that mistake (from which Frost made a tremendous recovery). He is a massive price at 20/1, while Colin’s horse (Elegant Escape (11st 2lb – 6/1 favourite – trained by Colin Tizzard) is favourite and there was about half a length between them in a novice chase here last year at similar weights. “I think we have got a nice chance – he ran a career best the other day in the Charlie Hall and we are looking forward to running him. “The Charlie Hall was a great prep race for the Ladbrokes Trophy. Black Corton had gone beyond his best at the end of last season – he had had 10 races by the time he ran in the RSA Chase at the Cheltenham Festival – so forget those performances. “We won’t ride him from the front this time around – we will ride him a bit differently. He is in really good shape and ran very well at Wetherby. He should have got 11lb off the winner, Definitly Red, instead he received 3lb and has gone up 5lb in the ratings. “I have been lucky in the Ladbrokes Trophy (won twice as a jockey and three times as a trainer) and it is a tough and competitive handicap. It is the sort of race Black Corton will love and we have every chance with him. 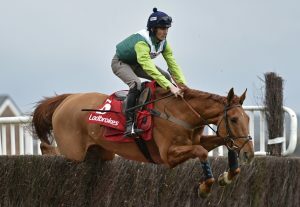 “Topofthegame learnt a lot last year and he is a lot stronger and better this year in terms of going chasing. He had one run over fences last term and fell here, so we thought let’s leave chasing for a year. He lacked experience and so we decided to revert back to hurdles. “He’s done plenty of schooling, is stronger and we’re happy with him. “We will have lots of others to run during the Ladbrokes Winter Carnival, but I don’t know what yet. Anthony Honeyball sent out the J P McManus-owned Regal Encore to finish third in the 2017 Ladbrokes Trophy and the 10-year-old chaser will run again this year. Regal Encore (11st – 50/1 – Rachael Green) and more-fancied stable companion Ms Parfois (10st 7lb – 14/1 – Aidan Coleman) worked at Newbury this morning. Dorset-based Honeyball, carrying children Harry (two and a half) and Hattie (six months), said: “Ms Parfois is in great form and has a fantastic chance. The race is made for her. “She is a very good mare and she has improved with racing. We always thought she would enjoy fences and after a slow start, she has been excellent. “Ms Parfois has done a lot of work already and been away a couple of times already. It is just nice to get her out on a bit of grass and let her stride out. Ms Parfois is bidding to become the second mare to win the Ladbrokes Trophy, following on from Kerstin in 1959 when the race was run at Cheltenham after being founded two years previously. Tom Lacey, who trains at Cottage Field Stables at Woolhope in Herefordshire, exercised Thomas Patrick (10st 9lb – 7/1 second favourite). He explained: “I’m delighted with Thomas Patrick. He didn’t gallop, but he is the sort of horse who enjoys a day out and he enjoyed walking around the parade ring. “We are going to need a bit more rain at the moment in an ideal world if he were to run. If the ground is good to soft, we would probably let him take his chance, but if it was any faster than that, he probably would not run. “He enjoyed a great season and had a good summer. Richard Johnson felt at Sandown that he was a lot sharper than he was last year. He has had plenty of racing and he has definitely taken a step forward. Richard Hobson partnered Allysson Monterg (10st 5lb – 25/1) in this morning’s work alongside stable companions Discko Des Plages (Tom Broughton) and Extra Bald (Shirley Becker). The Gloucestershire handler declared: “Allysson Monterg is in great order and we are looking forward to running him in the Ladbrokes Trophy. “We would have liked a prep run coming into this race, but it has not been possible this year due to the ground. “We have given him a couple of racecourse gallops. We couldn’t get him any fitter. “He won at Exeter first time out last year and he is a horse who I know how to get fit – it’s up to him to jump with fluency and run a big race for us. “Allysson Monterg won very nicely at Perth on his latest start off top-weight. He galloped away at the line. “We would like some more rain and the forecast is that there is rain due. “Hopefully, one day we think he could develop into a Grand National horse so we feel this longer trip is going to bring about more improvement. Willie Mullins, Ireland’s champion Jump trainer, was interviewed over the phone. He explained: “Kemboy (11st 8lb – 8/1 third favorite) looks the one for me to run in the Ladbrokes Trophy. He picked up a 4lb penalty for his win in the Clonmel Oil Chase. He will have a lot of weight to carry, but he is fit and well and will cope with the ground. “He won well at Clonmel. I suppose he was entitled to win that race. I didn’t think he was fit enough to win that day, he surprised me. He will improve for that run. “I don’t think Al Boum Photo will go. We will leave Total Recall (last year’s winner – 11st 3lb – 16/1) in at the moment. Rathvinden (11st 1lb – 25/1) is a horse I could bring over along with Pairofbrowneyes (10st 8lb – 16/1). “Invitation Only will probably stay at home, as will Up For Review along with Ilseofhopendreams – the ground will probably be too quick for them. Champion Jump trainer Nicky Henderson brought a team of horses including champion hurdler Buveur D’Air and two-mile champion chaser Altior to Newbury today to exercise on grass. The local handler, based just north of Lambourn, commented: “I’m pleased with Beware The Bear (10st 9lb – 33/1 – Jerry McGrath)). He will either run in the Ladbrokes Trophy or the Rehearsal Chase. “He won the Rehearsal Chase first time out last year. He is a good horse fresh and his work last year seems to be a cut above what he did last term. “I’m quite tempted to run in the Ladbrokes Trophy. The ground is important and will decide whether we go to Newcastle or Cheltenham. “Newbury is our home track and this is a big weekend. Ladbrokes have come in and really jazzed this weekend up into a carnival with great racing and a great atmosphere. 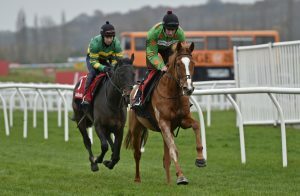 “Santini (Barry Geraghty) worked well and he schools very well too. I’m not sure what race at the Ladbrokes Winter Carnival he will run in at the moment as there are two novice chases, one over two and a half miles and one over three miles. “Both races are hotting up to be seriously competitive races. I don’t like running novice chasers over three miles first time out. I think he may start off over two and a half. I would like to find something easier for him, but he will probably end up coming here. “That gallop was just what the doctor ordered for our horses. Buveur D’Air (Barry Geraghty) is not a horse we want to run on fast ground which is a worry regarding Newcastle who are going to need a lot of rain. We have to try and not worry about that and keep training him for that race. “It was beautiful ground here this morning and Buveur D’Air is where he wants to be. It’s great that we got on grass too. If Newcastle was good, good to firm then we would be worried. I’m not sure what Samcro is going to do, but he wouldn’t want it like that either. This is the first time these horses have seen grass this year and these horses needed to gallop on grass as it’s a very important training tool for them. “He’s had a breathing operation as he always used to make this little noise. There was nothing wrong when we scoped him, but I just thought we couldn’t wait any longer. It’s better to get these operations done in the summer, than halfway during the season. Barry Geraghty sat on him for the first time this season today and he told me how much cleaner he was. “Altior (Ned Curtis) did his work nicely. He enjoyed the ground and he is in seriously good form. He is so fast at home I think I’d rather run him in the King’s Stand than the King George! We’re really happy with him and, all being well, he goes to the Tingle Creek. Richard Osgood, Newbury’s Clerk of the Course, reported: “The current state of the ground is that the jockeys who rode out this morning think it is riding good to soft. “When I walked it first thing this morning, I would have called it good, good to soft in places, but the jockeys do think it is good to soft. “The weather has got a little bit colder, but I’ve been told that this cold spell is not going to last too long. “Going into next week, we could get some showers. We wouldn’t consider watering at this stage. Ladbrokes’ Nicola McGeady is looking forward to the Ladbrokes Trophy. She said: “Colin Tizzard’s Elegant Escape is the current market leader with Ladbrokes for the Ladbrokes Trophy on December 1 at 6/1. “He was very impressive at Sandown on his seasonal debut and he bids to give trainer Colin Tizzard a second victory in the race following Native River’s 2016 win. “Thomas Patrick is the second-favourite at 7/1. Tom Lacey was very pleased with him this morning, but it looks like they will need a bit more rain in an ideal world. He has a good profile for this race. “Ms Parfois was another horse here this morning, It looks like she will need rain, but at the moment, she is the worst result in the book at 14/1 with us. “Kemboy for Willie Mullins, along with Ms Parfois, have been the two best-backed horses ante-post for the Ladbrokes Trophy. Willie said on the phone that Kemboy would run and he holds a similar profile to last year’s winner Total Recall, also trained by him. Entered for Ladbrokes Trophy. Second season chaser who signed off the 2017/18 campaign with a four and a half-length victory in a class three handicap chase (3m) at Perth in April. Has yet to race this season. Reigning champion two-mile chaser and unbeaten in 15 starts over hurdles and fences. Made it nine wins from nine starts over fences when taking G1 Celebration Chase at Sandown Park in April. Also victorious in 2018 G1 Queen Mother Champion Chase at Cheltenham and a dual winner of the G2 Betfair Exchange Chase at Newbury (2017 & 2018). Set to make seasonal return in G1 Tingle Creek Chase at Sandown Park on December 8. Entered for Ladbrokes Trophy. Gained biggest victory of his career under an inspired ride from Sean Bowen in Listed Rehearsal Handicap Chase (2m 7½f) at Newcastle in December, 2017. Best effort subsequently saw him finish fourth in the G3 Ultima Handicap Chase (3m 1f) on day one of the 2018 Cheltenham Festival. Dual Champion Hurdle winner, having followed up victory in 2017 with a game neck verdict over Melon in the Cheltenham highlight in March – his most recent appearance. Being readied for comeback run in G1 Fighting Fifth Hurdle at Newcastle on December 1, when his rivals may include exciting second-season hurdlers Samcro and Summerville Boy. Leading contender for Ladbrokes Trophy, currently priced at 14/1. Enjoyed excellent first season of fences last term, annexing Listed prizes at Newbury and Warwick, before finishing second in both the G2 National Hunt Chase (4m) in March and G1 Mildmay Novices’ Chase (3m 1f) in April. Has yet to race this season. Winner on three of four starts under Rules, with only defeat coming when third in G1 Albert Bartlett Novices’ Hurdle at Cheltenham in March. Won on hurdling debut at Newbury in Ladbrokes Novices’ Hurdle at last year’s Ladbrokes Winter Carnival before going on to beat Black Op in G2 contest at Cheltenham in January. Ended a fine 2017/18 campaign with victory in G1 Sefton Novices’ Hurdle at Aintree in April and set to go novice chasing this season. Second favourite (7/1) for the Ladbrokes Trophy. Much improved as a chaser last season, winning three of his four starts. Ended the campaign with a front-running victory in the G3 Betway Handicap (3m 1f) at Aintree’s Grand National Festival in April. Beaten a half-length by Elegant Escape on comeback in Listed Future Stars Intermediate Chase (3m) at Sandown Park on November 11. Fell on only chase start so far in a Newbury novices’ chase (November, 2017) but subsequently enjoyed a productive campaign over hurdles, with three good efforts in major handicap hurdles. Fourth in Listed Lanzarote Hurdle at Kempton Park in January before winning competitive G3 Sandown Park handicap hurdle in February. Beaten a neck by Bleu Berry on latest outing in G3 Coral Cup at Cheltenham in March. Due for a return to chasing this season. Twice successful at Listed level over hurdles at Auteuil in France prior to joining current connections in late 2017. Has made two appearances, both in novices’ chases, for Paul Nicholls, taking second at Exeter in November, 2017, and falling at Chepstow on October 14, 2018. Grade 3 handicap chase, £250,000 total prize fund. 3.00pm, Newbury, Saturday, December 1. Three miles and two furlongs (3m 1f 214y). For four-year-olds and upwards. Penalties: after November 4, a winner of a chase 4lb, a winner of two chases 7lb – no penalty to increase a horse’s weight above 11st 12lb. Entries closed October 30, entries revealed October 31 (56 entries, 1 subsequently scratched). Weights revealed November 7, scratchings deadline November 13 (42 remain), five-day confirmation stage November 26, final declarations November 29. Maximum field 24, plus 2 reserves.